Someone at the Christmas party asked me why I don't eat animals. Perhaps I can start with the most basic principal. This world is created by a Power beyond comprehension. It is the Creator of manifestation and therefore, manifestation itself. It is infinite. It has no limits. It is the Power we worship. Since it is infinite, God is the human, the air, the grass, and the turkey all at once. Therefore, I will try my best to treat my Creator with utmost love and respect. Christ is another name for this Infinite Presence. Turkeys, like humans, very much want to live. They run away when I try to kill them just like humans do. They have babies just like humans. They take care of their babies just like humans. They talk to each other just like humans. They are an embodiment of this Infinite Presence. So naturally, my heart reaches out to the turkey. Feels compassion for the turkey whose half-eaten corpse lies on the table on the day of the celebration of Christ. Imagine if I had to go out and kill the turkey myself so I can enjoy eating it. It would be very hard for me to kill a turkey. I see the bird alive before my very eyes. It would scream and gobble in terror as I cut its throat! It is an aspect of my own Beloved. Imagine if I took care of a pet turkey since he was born, and I named him Angel. Now if my pet turkey was killed by someone for their Christmas dinner, I would be deeply sad. I took care of Angel like my own son, and now he is gone. On the other hand, the fruits from a tree are ready to be picked. They are bowing down to earth for the nourishment of other beings on this earth. It is difficult to avoid killing life, but I can try my best according to my body's capacity. It took about 2 years of adapting to the vegetarian lifestyle before my body could accept it. And it helped me to expand my love for the Divine Presence. I pray for the poor turkey who is sacrificed for human hunger. May we see the Divine Presence in our lovely turkeys and give them all the support we can. 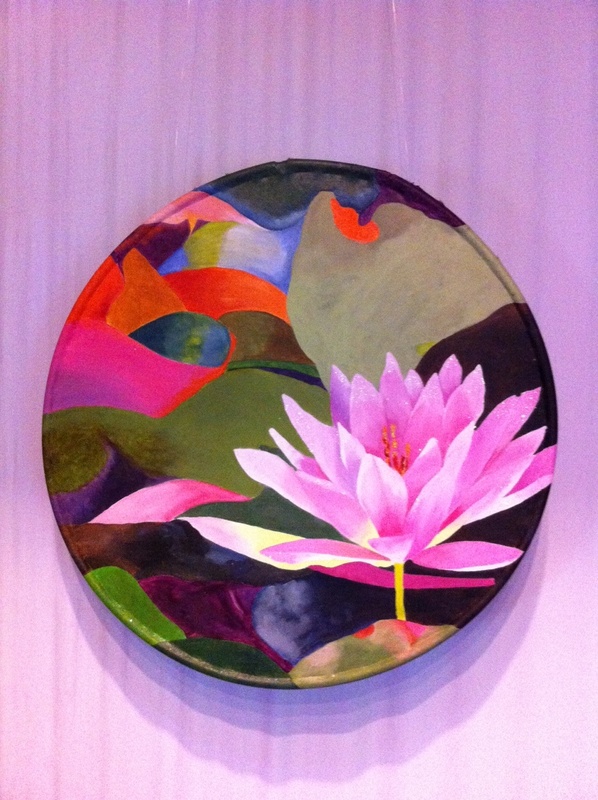 When I arrived in Orlando, Rafael presented me with a painting of a lotus flower. He said that he was inspired to paint it when he found out that I was coming to do satsangs at his home. The painting was a gift to Swami Purna - an offering from the depths of his heart. To Rafael, Swami Purna was coming to bless his home. "Let me clean up my home for my Beloved," he said. And Rafael was delighted to clean his home. You see, when Rafael showed me his painting, tears welled in my eyes. There is no greater gift than devotion to the Lord. "It was easy to paint," said Rafael. "I just thought of Swamiji and the painting came." He hung this painting above the picture of Swamiji in the satsang room. I am happy to sit under this painting and hold gatherings here. The pink lotus flower is a representation of the human heart open to divine love. When the heart is saturated by this love, the world becomes an ocean of nectar. As a lotus flower, we cannot be stained by the muddy waters around us. We remain untouched, beautiful, open to the shining sun of Grace. We held satsang at the home of Nicolas, Reny, Michel and Rafael. Michel and Rafael spent a couple days setting up a very beautiful room. Building a stage. Decorating with plants and candles. Michel created a bookstore. Nicolas arranged lighting. Rafael painted a large lotus flower overhanging the stage. 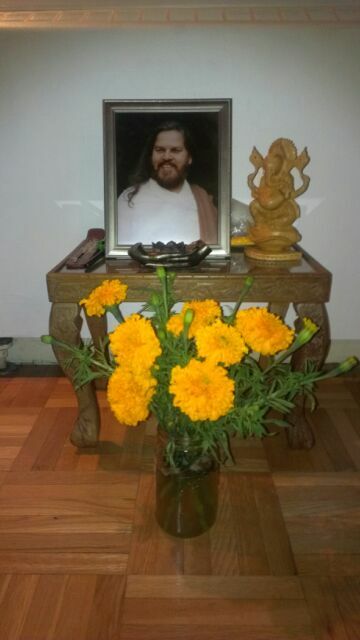 The room turned out to be be quite stunning...all centered around a picture of Svami Purna, the One we honor. After satsang, I contemplated the nature of my expression. It is centered on one principal: the passion for God. Do I want God more than everything else? Look at all the possible distractions in this world. I want approval, I want tasty foods, I want security. The desires are endless. Who created all of this? How do I bring the attention so completely on the Creator that I am consumed in this obsession. I eat God, I breathe God, I dream about God, I see God, I speak about God. It pains me deeply to think about anything else even for one second. I cannot live without Thy presence, Oh Lord. Perhaps this unquenchable desire will inspire people to jump into the fire too. My “house” is burning down in this fire. Once this fire catches, it is so hot that nothing survives. Come with me and jump into the fire. Let us burn together. Oh Lord, lead us from untruth to truth, from darkness to light, from death to immortality. Let us sing songs to Thee through eternity. Thou hast given everything to us. Thou art life itself. May we give it back to Thee. It has always been Thine. At a recent satsang in Miami, someone asked if I would come down from Orlando to hold satsang on her birthday on December 31st. This request struck the core of my heart. Someone wants to dedicate her birthday to God? Inwardly, I was collapsing. You want to do this on your birthday? Not many people spend a birthday honoring Him. And surely no one ever requested something so beautiful in such a direct way. "Yes, I would be honored to hold satsang with you on your birthday." Remembering....He gives birth to us, He breathes us, He speaks us, He gives us the feeling of love. I am quite overwhelmed by this request. Tears fill my eyes. How can I forget Him who has given everything? I will do anything for You. I realize there is a prayer that must be expressed. There are some of my friends that desperately want to return to You. The wish is so strong that sometimes they are crying day and night for You. And their longing is becoming stronger day by day. Please hear the cry of my friends. Their hearts cannot live without You. Oh, Lord, You are the Soul of the Universe. You are beyond my mind's understanding. Your ways are mysterious. I am amazed by your Power. Your Light is so bright, I cannot face it directly. Although I cannot face You directly, I beg you to bring these friends to Your Light...to make their surrender complete. How may I assist You in making this wish come true? Please show me the way. 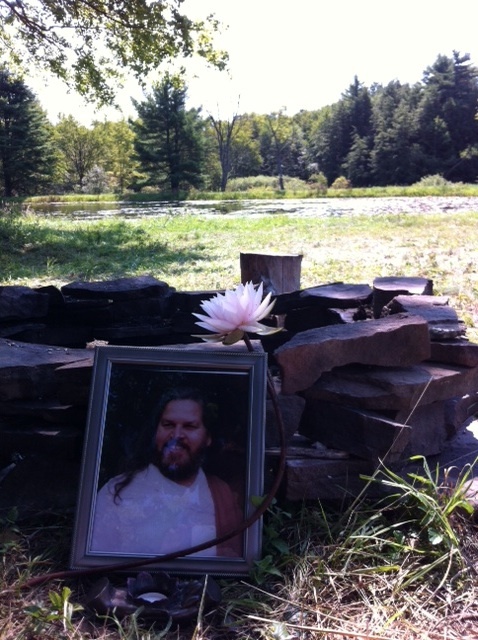 I was invited to hold a private satsang in honor of Kip, Karen's brother, who had just passed away at a relatively young age. I said "yes." But my stomach was in butterflies. I've never held the space for such an occasion. And I had never met Kip. MaFer and I arrived at the event in a feeling of unknown. My mind could not grip onto any words or ideas. Surprisingly open to whatever was to unfold. We sat down and contemplated on the nature of death. What happens to us when the body passes away? Well, the real question begs to ask: "Am I this body that lives and dies in such a brief period of time?" The body and mind are thoughts. Sensations arising in mind. They rise and fall. None of the thoughts last. They are constantly changing. If all the thoughts of body, mind and senses constantly change every moment, how can I truly be a changing thought? I watch the changes. I am not the changes themselves because they pass away. 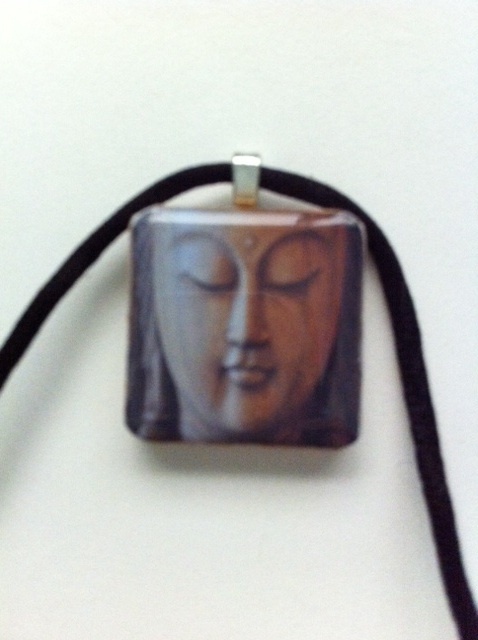 So what watches the impermanence of mind and body? When this revelation comes, the immortal Self shines through like millions of stars. I am the Cosmos, the infinite presence that contains all the passing thoughts of this universe. Shed this costume of a temporary human mind and embrace the Truth. You were never born, You can never die, and You are timeless. The passing of Kip's body brought people together to look beyond themselves. To something greater than a mortal body. He brought us together to realize how wonderful it is to pray for others. To honor those who have passed on, to send them light and love. To remember how precious each person really is. To recognize the Divine spark in our fellow beings on this Earth. To help others realize this Divine spark. To let go of my own desires and serve a greater Power. Oh Lord, you are embodied in all of creation. Let me worship you in your awe-inspiring glory for all of eternity. Let me serve You with every particle of my being. Verily, this mind, body, and soul has always been Yours. Recently I was invited to a yantra meditation with Victoria. She paints beautiful pictures of yantras - brilliant, swirling colors coming to a single point in the center called the bindu. Yantra is a doorway into the formless essence. It cannot be understood because it is beyond conception of the mind. That is why its meaning cannot be explained adequately. It is an ancient symbol in Vedic tradition that provides a powerful focal point for meditation. And these yantras contain the blessing of Swami Purna. This means that Victoria must go through sometimes difficult purification in order for the yantra to come through. Surrendering her life and ego to the will of the Holy Spirit. It can hurt physically, mentally, emotionally...but after going through the fire, she comes out as pure gold. According to Victoria, she had had a clear vision before I had confirmed my attendance that I would be the only one to attend out of the many people she had invited. It was true. We focused on the Agni Yantra - a red, orange, yellow, and white whirling flow of paint marked with a tiny bindu in the middle. The Yantra of Fire. That power which is present throughout the universe in physical form or potential. Oh, God of Fire, we bow to Thee - the One who digests food, keeps our bodies warm, lights up the stars, and gives light to the Cosmos. The One who purifies old emotional patterns that are no longer needed. The spiritual fire that burns illusion and ignorance and allows us to see beyond the world of Maya. Victoria gently guided the meditation, suggesting that we let go of any ideas of yantra. 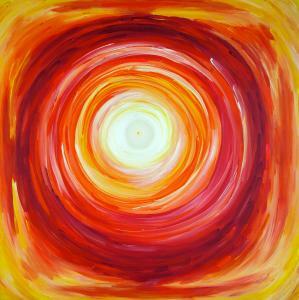 I was pulled into the center of the yantra and felt the energy of fire from heart to crown chakra. Thoughts came up and burned in the energy. Mind focused more deeply until it began to meditate by itself. Closing my eyes, I could still see the shape of the yantra in opposite colors of green and blue and black. That was kind of neat. Yantra is a profound way to connect to Grace. So simple, so elegant, so cleansing. Yantra calls me to my home beyond form. Letting go, allowing It to be revealed which has always been. In one spiritual gathering at Forrest Yoga studio, Maria's two children attended. My expression naturally adopted a child-like quality. Vocabulary simplified, sentences shortened. An innocence came through that I was quite moved by. It felt like being a child - genuine, uninhibited, real, true, simple love, so excited to participate and sing my heart out. I am a child of God. I am resting in His arms. More and more now, I let Him hold me and take care of me. He is my mother, my father, my friend, my relative, my everything to me. I feel safe here. I can let go. The next evening, returning to Cindy's complex in her Subaru after a beautiful yantra meditation, I drove to the gate and Lewis, the guard, greeted me from his station. "I really like this little car," he said and then began to enthusiastically describe all his reasons why. "What kind of car do you have?" I asked. "These two legs," he said. Then Lewis proceeded to tell me that he had had a divorce and had lost everything including his home and car. "My children don't even call me Dad anymore. They call me Lewis." Then I drove on to Cindy's place and went inside to get those flowers. I walked back to the station and waited about 10 minutes for an opportune moment when the cars stopped coming. 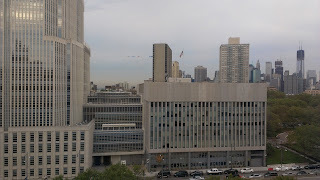 Then I strode up to the little building and looked inside. "Lewis, I have something for you. These are to keep you company tonight." Lewis took the flowers and shook my hand gratefully. "I could take them home," he said. And then he thought a moment. "Well, I can keep them here for everyone to enjoy." And he showed me a large water bottle. "This is good," he said excitedly. "Do you think they'll be okay with tap water." I nodded my head. "Yes, I think so, Lewis. Have a good night." He shook my hand again and I walked back to Cindy's home, smiling. I have only One Heart. And I give it to You. Norma assigned me task. To gather sticks. I went down to the wooded yard, collected a bunch, and brought it inside for the stove heater. Finished my little seva task for the day... What is missing? I said to myself. Most of life is a series of tasks. I finished sleep, I'm done with breakfast, I did my meditation, I completed a retreat. The more tasks I finish, the more productive I feel. Then when the body is dying, I look back at all the tasks completed and wonder, "What is the point?" So I looked back out at the trees and contemplated. Here were these majestic trees providing blessed shade and oxygen to this home. They shed pieces of their body, and I took these limbs to burn in a fire so that my body could stay warm and comfortable. They never asked for anything back. They never complained or bragged. I thanked the trees for their generosity. Then the mind asked who created the trees for our enjoyment. The Creator. 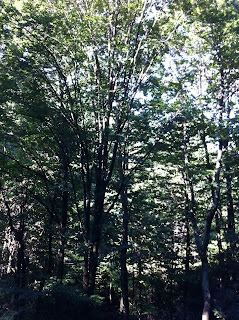 Ah, the Creator resided in these trees. They weren't just trees. I prayed for the Creator that gave of Itself. I praise the Creator. I sings songs for the Creator. I can't stop because that is all there is to do in life. Every action, every thought is dedicated to Him. So I keep singing for Him. And Love springs from this Song like an endless spring. Norma and I went on a hike, and I saw Him there. Towering green trees over the trail, golden sunlight shimmering through the leaves, cascades of waterfalls passing over and under gigantic boulders, gnarled roots winding over the ground, clear blue sky and clean air. I was in awe. I meet God in Nature and bow down to the tremendous beauty that He displays. Wherever I look or sense, He is there. Resting in the awe. A few days ago, I spoke to a friend and medical intuitive about the kidneys. "The body needs to urinate too often," I said. He told me I was being exposed to toxins in the environment. In fact, there were three chemicals inside Persistence that weakened the kidneys. Petrochemical, gas, and pesticide. "You could get a new vehicle," he said. I couldn't afford that option. "You could clean the carpet." That was a good idea. The next two days, it poured in Banner Elk, NC. When the weather cleared a bit, I went down to see Persistence. Inside the van, I notice the carpet was damp. Wiping a hand across the floor, I was shocked to see my palm covered in oil. When I spoke to Norma about this, she suggested to take out all the carpet and the floor boards all the way to the metal. I sat down. My body had been exhausted all day. Norma picked up the phone and invited a good friend to come over and strip the van. "Better get started taking out your stuff," she said to me. So I spent the next two hours unscrewing bolts and removing almost everything. 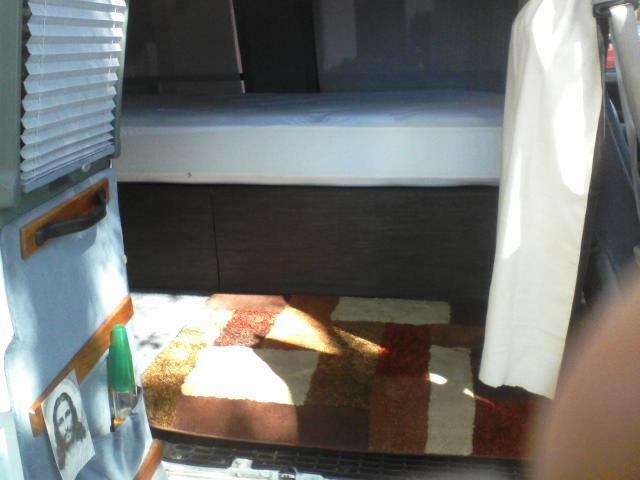 Victor arrived and we took out the bed and cabinet and unscrewed the second battery and solar panel connections. Then he cut out most of the carpet, and we tore out large pieces of foam and underboards. In the darkness of night, after the floor was swept and wiped, we put the bed and cabinet back inside. It had been two and a half hours of activity. With his concentration and dedication, Victor had saved me. Praise to the power of Shakti. She can achieve anything. Today, Persistence is stripped to the metal. Purified with vinegar and baking soda. Norma has kindly offered to create a team in Miami to rebuild the van's floor and stop up all the holes. Her ability to get things done is a rare talent. In fact, had it not been for her push, I would have just lived with the chemicals until it was intolerable. Yes, my laziness is a rare talent too. Persistence is a shell now. As her floor was stripped away, so has mine. I'm doing jobs that I've never done before - very physical and somewhat mechanical. Clearing away beliefs of "I can't do it" and "it's too much work." I am a shell. Now all I need is a new floor - clean and insulated. So I cannot be harmed by the harsh elements of the world, so I can stand on dry ground. The inside of my vehicle is being restructured and rebuilt. Taking the road of purification. I'm ready. Lora travels slowly in life. Why? Because she's always looking for the little things to give back to her Beloved. Her Beloved who has given so much and never asked for anything in return. Thank you, Lora, for your kind and thoughtful manner. You are so giving, you are a gift. The day after I received darshan with Swamiji, I got a phone call from a company holding a lot of my savings. I sat in my van, Persistence, looking out at the wooded campground. It was beautiful day in Hawley, PA.
"I have an update regarding this investment," said the voice. "Since the crash a few years ago, it appears that it will not be turning out as we planned. The money is lost." The man continued to explain as I listened in silence. I think he expected some sort of reaction. After I had asked a couple of questions, I said, "Thank you so much for letting me know." And I hung up the phone. "Thank you, Swamiji," I whispered to myself. This money had been my safety blanket, and now it was gone. Suddenly, grief struck at my heart, and tears fell from my eyes. For all these years, I had spent my life force worshiping money as my God. Why had I wasted so many years worshiping money when I could have given my heart to the Real One? I had missed my Beloved all these years. How could I have rejected Him for so long, giving my heart to a cold piece of metal? The clouds around my heart started to part, and the sunlight poured inside. My vision changed, and the colors of manifestation became a sparkling rainbow. This afternoon, I received a message from Paypal saying that I had received a donation from someone unexpectedly. I wept in gratitude for Divine Grace that wants to support this journey I am taking. I stand naked in this world, giving my life to the One who takes care of me, storing my savings with this One. No longer can I worship money. I turn my face to the Light like a child seeing his Mother for the first time. the vibration of the Cosmic Motor. May all beings return to this place of awareness. May all beings be freed of their suffering. May all beings be an expression of peace, love, and joy. Let us work together to bring this transformation about in the world. Jai, Jai, Swamiji, let Thy Grace embrace this Earth. I have only One Heart. I am staying at Norma's masterpiece of architecture in the woods of Banner Elk, NC. It is a place of natural wonder, a place for meditation and contemplation. 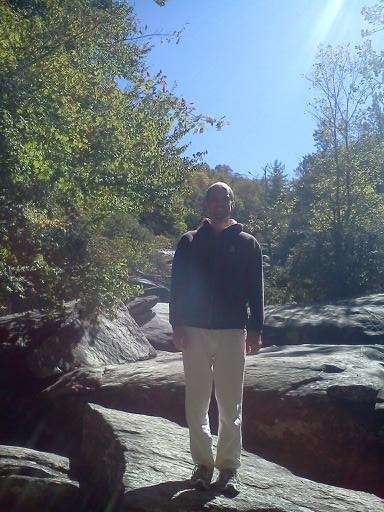 Going from the bustle of New York to the stillness of Banner Elk, the mind still comes with me. It creates a similar environment no matter where the body goes. Where ever I go, there I am. Will the mind ever be still? If not, let it think about beautiful and noble things. Chip came over to deliver a truck load of wood to the house. I greeted him cheerfully and started to help him stack the wood under the roof of a shed up the hill. Chip appears to be about 70 years old. He has been living in this area for 40 years. He has a strong southern accent and a deep connection to this land. Chip pushed a heavy wheel barrow of wood up and down the hill. I was surprised that a man of his age was able to do this. He gave me a pair of gloves. "Be careful handling this wood, you can get splinters. I don't need gloves since I know how to handle it." I was grateful for the gloves. For his simple care. I stacked the wood under the roof as neatly as I could. Norma likes things done neatly, so I try to do my best. After a few trips up and down the hill, Chip sat down in the wheel barrow and rested. "This is good wood. It has more BTU's than most." Then we had a discussion about trees and how certain kinds of wood burn longer than others because of their density. I felt the energy of the wood, and it was powerful. Suddenly I had a deep appreciation for trees. My body was cold up in these hills, and I needed the fire in this wood to keep it warm. Chip had been to larger cities but preferred to live here in the hills of North Carolina. "Why do you like this area the most, Chip?" "Well, I guess it would be its beauty." I looked up. Sunlight passed through the branches and lit up the leaves with a warm golden glow. I pointed at this scene. "Chip, just look at how beautiful it is." Chip spent a minute gazing up at the golden leaves. "It's good to meet someone who knows what I mean." A couple days later, Chip came up to the house to collect his money. As I gave it to him, he pointed out some trees on the property. One of them was a locust tree. "Bees drink from the flowers of that tree and take the nectar back to their hives. There, it becomes locust honey. And if you eat this honey, you won't get allergies." Suddenly I had more appreciation for the bees and the trees. Mother Nature gives people healing powers, and She does not ask for anything in return. 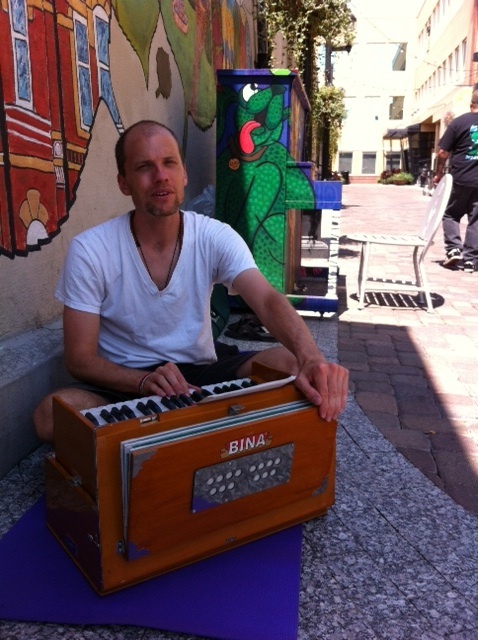 I play harmonium outside on the deck now, sending energy to the trees, the plants, the bees, the butterflies. My heart is filled with gratitude for all my fellow creatures here. I embrace them with this music. I bow down to the Creator that gives so much for my benefit. How can I give back? Thank you, dear Chip, for your wisdom. After meeting David for the first time at the retreat, he invited me over to his apartment in Brooklyn to hold a satsang. A few people shared quite deeply an experience of love. The sharing created a safe space and an opening to the beautiful energy that came through. Sharing really breaks the ice in satsang especially since most of the people did not know me. Authentic sharing also requires courage and vulnerability. I bow to those who open their hearts to the Grace and risk being known. Let us be real, let us drop the mask of pretension, let us reveal our broken heart. This is where the transformation comes from. Today, as I fast for 24 hours, I speak to David about the clouds of depression and boredom passing through my mind. And asking Grace for more lightness in life. 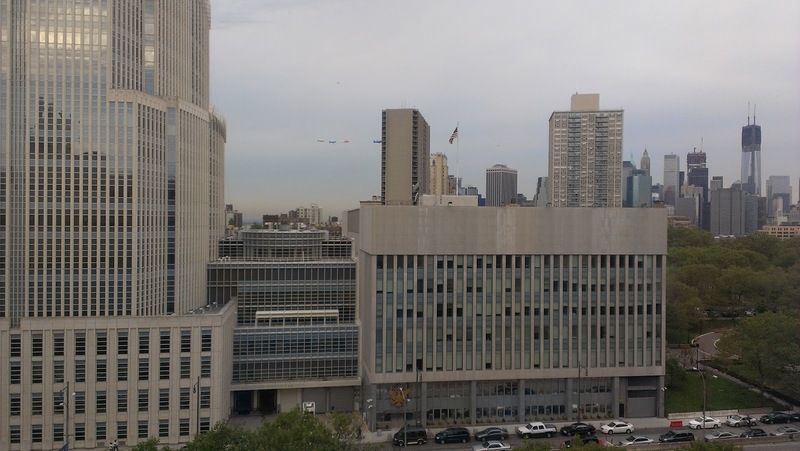 Then he points out the window and we see this vision of 4 blimps swimming like fish across the New York City sky. And we both started to laugh. Tears filled my eyes. Why can't we just float? On my way to the retreat in Hawley, PA, I was stopped by a cop name Fab. He asked for my papers and I gave them to him. Normally, fear of authority and getting in trouble causes me to freeze, but this time, I was happy to see him. Then he asked me where I had come from and where I was going. I suppose the Texas license plate was rather suspicious. I described the retreat with Swamiji as well as my 2 year journey through the US. Somehow, he was amazed at this story and asked if he could see my bed. 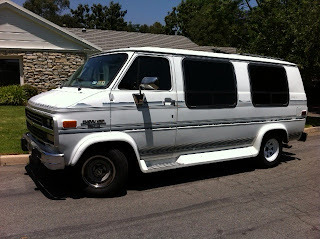 I opened the back and he marveled at how I could be living in my van and spreading a spiritual message. What a strange concept! I gave him the website for Swamiji and also for my journey, and he said he would follow me on the blog. He also gave me some advice about how to make life more comfortable on the road. After half an hour, I said good-bye to Fab and went on my way. He was in very good spirits when I left. But I never found out why he stopped me. Perhaps Fab wanted to join a satsang on the side of the road that day. Perhaps he wanted to find Swamiji. He certainly showed me that cops are not as scary as my mind imagines them to be. May Fab be blessed with a spiritual fire in his heart. I arrived in Ann Arbor, MI recently. 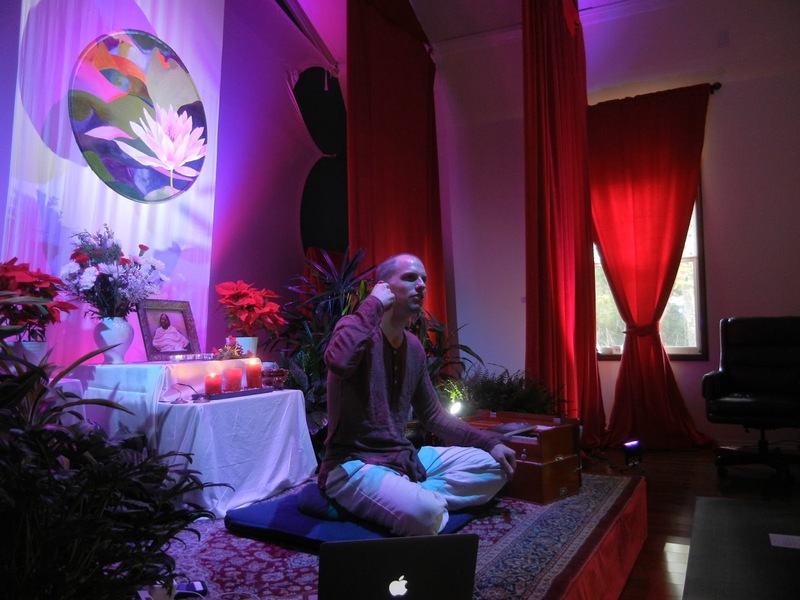 Before coming, I had discovered Atmaram through a google search for "kirtan" and "bhakti." After e-mailing him, he called to invite me over to his home for dinner and kirtan. What a delightful surprise! He plays the harmonium and drum, and his Teacher is Muktananda. I was deeply moved by the energy of his beautiful raga version of the Hare Krishna Mahamantra and told him so. Atmaram and I are soul brothers. His heart is filled with tenderness and his knowledge very deep. I feel his love even now. Never had I been so warmly welcomed, particularly by someone I had just met. 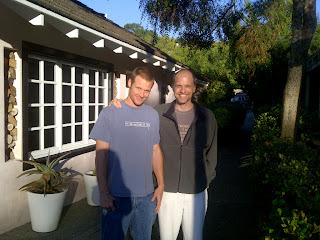 We ate together, played together, and discussed form, formlessness, and the guru. His dog, Mocha, was just as enthusiastic about the whole event. It is said that during the Golden Age, one could travel across the country and one would not need to be concerned with food or shelter. Everyone would take care of you and provide everything you need just like family. This visit with Atmaram took me back to the Golden Age. I visited Uncle Ted, Aunt Madolyn, and Lizzie in Ann Arbor. They opened their home to me for at least 5 days, and we bonded together. For every topic or question I had for Uncle Ted, he had a story to share his wisdom. I love stories. Aunt Madolyn made sure I was comfortable. She has the divine mother energy. Lizzie has an intelligence beyond her years, and she thinks in poetry! One morning, I was doing yoga on a mat in the back yard just at the border of the neighbor's yard. I wore a jacket with a black hood as it was cool outside. When I came in, Uncle said, "Our neighbor just called. He warned me about a person in the back yard doing yoga in a black hoodie! 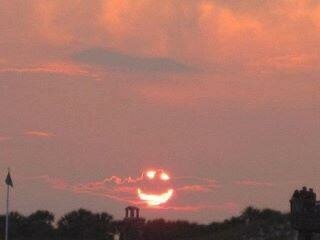 Then I looked outside and told him it was just my nephew and everything was going to be alright." For the rest of my stay, many times I would laugh out loud, thinking about the neighbor's warning. Watch out for the yogi in the black hoodie! I arrived in Fort Collins for its birthday party. The beautiful Colorado city bustled with thousands of people who were there to listen to famous bands and partake of the many foods. I went straight to Om Ananda Yoga studio. Sarada, the director, had kindly invited me to do kirtan (singing to one's Beloved) on Friday night. I am deeply moved by her kindness and acceptance. I hope to meet her personally one day to thank her for allowing me to use her space. Near the studio, I discovered a little alley where a friendly youth named Jasper was playing a brightly painted piano. I sat down to play the piano, and thought I would bring the harmonium to play in the alleyway. So for the next 3 afternoons, I played the harmonium and sang sanskrit mantras to the passersby. At first, I was quite shy and embarrassed and looked away from the onlookers. But by the 3rd day, this self-conscious aspect was mostly dissolved. I was advertising the upcoming satsang, and this music was to uplift people and purify the city environment with its vibration. It seemed, in fact, that most people had their own shyness and would often just glance surreptitiously at this street musician. I made a couple of friends during the performance. One of those friends was my own self. It seemed that my body was walking taller and more confidently after playing for the people. Somehow, I cared less for other's judgments and thoughts. Well, it turned out that two people arrived at the satsang at Om Ananda Yoga Studio. The rest probably joined the throng who had showed up for Fort Collins birthday. We had a beautiful chant, singing the names of the Lord. Please let me continue to chant His name constantly 'til the end of time. Let me bring His Name to others for the upliftment of His Cosmic Creation. May Om Ananda flourish with His Grace. Thank you, Sarada! I visited the SCS Mission in Salt Lake City this past weekend. Grace certainly planned it so that I could arrive at the monumental installation of the Sri Chaitanya installation at the temple. This event is so significant that the installation day will be celebrated every year from now on. 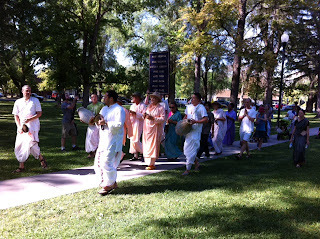 When I arrived, they were about to begin the Hari Nam march through the streets of Salt Lake. 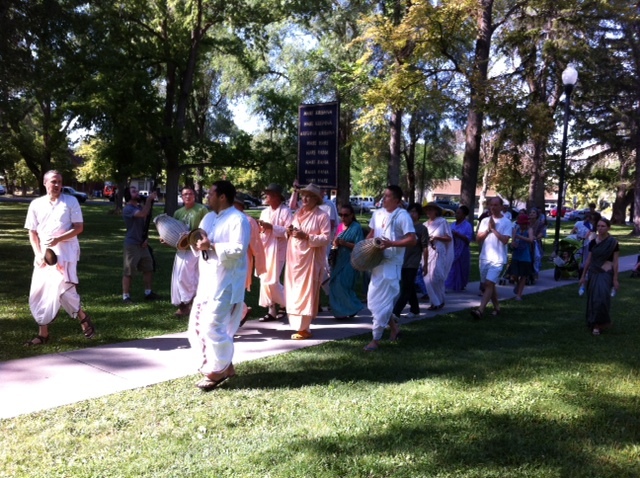 Joyfully we danced along the sidewalk, chanting Hare Krishna and playing various instruments. It was my first Hari Nam, celebrating Sri Chaitanya's early morning march a thousand years ago. 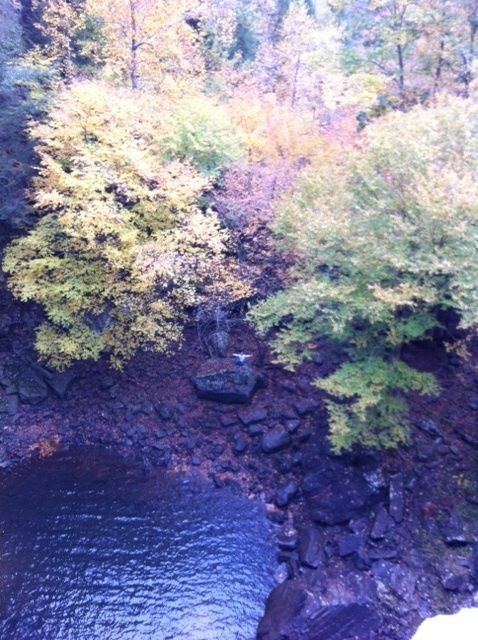 The picture down below is a remembrance of our walk. 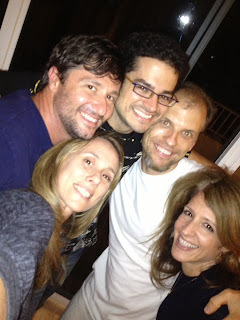 Three great Sanyasins (renunciants) were in town - the guests of honor. The next day, we hiked through the mountains nearby along pristine lakes surrounded by towering trees. And the last day, we celebrated the installation of Sri Chaitanya, chanting devotional songs in sanskrit and singing the name Hari. I had the opportunity to wash many dishes and help out in other ways. The devotees serve the Lord in such a focused and powerful way that I was very much humbled. They treat one another as family, taking care of one another's children and cooking free and delicious food for large numbers of people. Indeed, seva is taken to such a high level in the community that I have not seen the likes of it anywhere. Thank you to Sudarshan and his mother, Mata, for having me at the temple. They work tirelessly for the Lord. May I learn from their incredible example. I went to Novato, CA, just north of San Francisco, to hold satsang at the accupuncture clinic where Terrence and Joy tirelessly work together. Terrence took me to Mount Tamalpais, a holy mountain above Mill Valley. The energy is brought forth by the divine mother who dwells in all of creation. Satsang was centered around appreciation. Who is your life do you appreciate and love? What about that person or animal or thing do you love? This feeling of love is the key to opening the heart. When love is present all the time, suffering cannot touch you. One young woman spoke of her father who had just passed away. He had supported the family and given everything to support them. As we listened, we had tears of empathy for this woman's love. Her father was at the satsang in spirit. We can only learn from his example. I found that this participation, again, adds such depth to satsangs. Let me continue to learn the skill of listening to others. There are jewels in their words. Terrence and I did a puja to bless the clinic. He is helping me to put together a couple of short recordings of the satsang. Thank you, Terrence, for your devotion to Truth. You are my teacher. 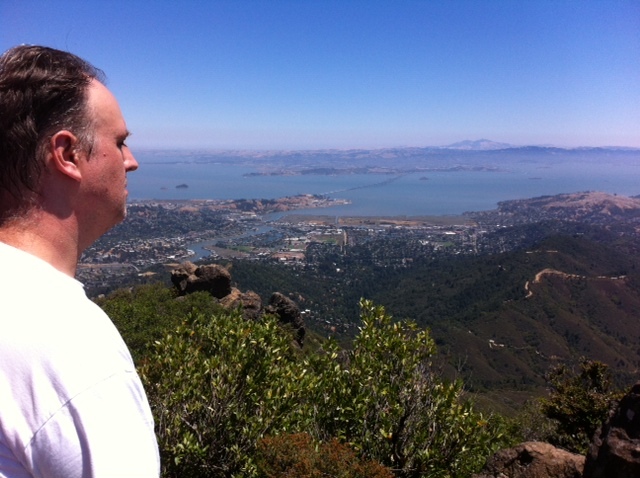 Up above is Terrence sitting in meditation on Mount Tamalpais. Joy gave me a a free accupuncture treatment and loaded me with homemade food for my journey. Thank you, Joy, for supporting the spiritual cause. Your generosity goes so far and beyond!